Gory, beautiful chaos, if a little frustratingly rough behind the scenes. A good afternoons chaos, and thats what matters. Remember when platformers weren't all trying to be arty metaphors for life, loss and all that other fancy crap? 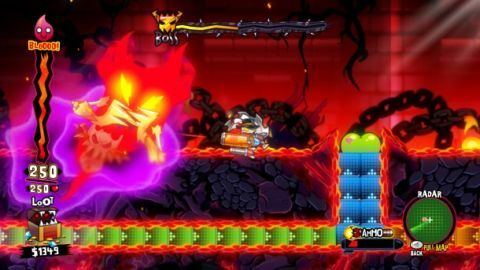 If you find a metaphor in Hell Yeah's relentless assault on your eyes and sanity, it's only because it's about to get dropkicked by an angry demon rabbit riding a giant spinning death blade with a jetpack on the back. This is one of those games where the design process didn't involve whiteboards and long discussions, but some chemist's secret stash being ground up and dripped into the artists' eyeballs. You're Ash, disgraced rabbit prince of Hell, on a quest to kill 100 wacky monsters who saw paparazzi photos of you playing with a rubber duckie in the bath. That's as sane as Hell Yeah! ever gets. It's a game where firing shark missiles is all in a day's work. Getting to your enemies is relatively standard platform fare, with the twist that you can often drill through obstacles, boost jump around the place, and acquire different weapons. Actually killing your foes, however, involves playing Warioware-style microgames such as stealing honey from a suspicious bee to unleash an appropriate fatality move, which might be having a dinosaur bite their head off for you. It's the chaos of Earthworm Jim in the levels of Sonic the Hedgehog 2, with a little Ren and Stimpy/Invader Zim (delete according to age) thrown in for good measure. Gags and minigames repeat more than they should, but still survive the repetition of gags and minigames repeating more than they should, which both gags and minigames do. The action itself, while enjoyable, soon lets things down. While Hell Yeah! is a fantastic looking game, it's one that paid more attention to looking good than playing great. There's so much going on most of the time that it's often hard to take in and get a proper read on the levels and what's going to hurt if you run straight into it. More routinely irritating are the controls, where double-jumps, skids and simply being knocked back by enemies will often frustrate you. You want an Xbox 360 controller for this one. You could play it with a keyboard, but only in the same sense that technically you could fly if you flapped your arms hard enough. Either way, prepare for unhelpful checkpoints, and the irritations of repeated cutscenes and similar hold-ups soon being promoted to fully-fledged annoyances. They take the shine off the chaos rather than the fun out of it, however, and you soon return to the forward momentum Hell Yeah! needs. The game's obvious enthusiasm carries it over these bumps in the road, and if you can forgive, you can easily forget in the race for the next bit of insanity. Hell Yeah! is no platforming classic, but it's cheap enough to be worth a punt if you like the idea of its craziness, and crazy enough to get your money's worth long before the end.